The Orlando Magic Youth Foundation has partnered with Valencia College and Seminole State College to award current high school seniors that plan to attend Valencia College or Seminole State College during the upcoming fall 2013 term. This scholarship is available for two years. One recipient from each school will be awarded $6,000 for a total of four semesters. The student must be a graduating senior from Seminole, Orange or Osceola counties. Student plans to attend Valencia College or Seminole State College beginning as a freshman for the fall term of 2013. Please include a typed statement with your completed OMYF application of no more than 500 words. IF YOU COULD CREATE YOUR OWN COMMUNITY SERVICE PROGRAM OR ORGANIZATION HERE IN CENTRAL FLORIDA, WHAT WOULD IT BE, WHO WOULD IT SERVE AND WHY? Provide information detailing extracurricular activities, school activities and/or honors programs. Academics – Students are expected to maintain a minimum of a 3.0 GPA at VC or SSC in order to qualify for award dollars each semester. Community Service – Students are required to complete 30 hours of community service per semester. The Orlando Magic Youth Foundation Department will gladly provide recommendations on possible projects, internships and opportunities for community outreach. It is the responsibility of each student to forward copies of their hours to VC or SSC. Extracurricular Activities– Participation in extracurricular activities is encouraged. These activities can provide students with valuable experiences to develop leadership and team building skills. It is also a great way to help build your resume and meet new people. *If you are applying to Valencia College and Seminole State College – please mail applications to both institutions. 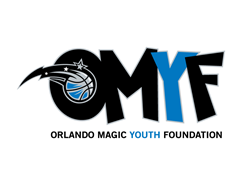 Please visit: http://www.nba.com/magic/news/cohen_scholarships_051111.html to learn more about OMYF and their past recipients.